Singapore International Water Week (SIWW) took place From July 10 to 14. This international gathering is hosted biennially by the Ministry of the Environment and Water Resources of Singapore and Singapore PUB. It consists of two parts: international conferences for water-related stakeholders, including water-ministers’ conference, and an exhibition by water-related companies. SIWW has become the second largest water-related event after the World Water Forum, attracting participants not only from the Asia-Pacific region but also from the US, Europe, and the Middle East. As secretariat of the Asia-Pacific Water Forum (APWF), the JWF organized the Governing Council Meeting of APWF and co-organized the Joint Anniversary Celebration of the World Water Council and the APWF, an event marking the 10th anniversary of the APWF and 20th anniversary of the WWC. After participating in SIWW, I visited Johor Bahru, capital of Malaysia’s Johor State. Johor Bahru is located just across the bridge over the strait from Singapore, and is easily reached by car. 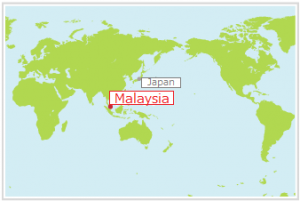 Singapore and Malaysia are located in a geographically important place. East, and Africa, they have to go around the peninsula. When oil and other raw materials are imported to Japan, they follow the same route. Figure 2 shows shipping routes between Japan and South Asia. If they couldn’t use the Malacca Strait, ships would have to go through the islands of Indonesia. 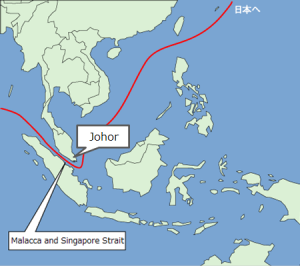 The narrow Malacca Strait is very important not only for Asia but for all countries around the world. Singapore, which faces the Malacca Strait, experienced difficult periods in its history, as it was brought under the rule of Portugal, the Netherlands, Great Britain, and Japan. This is because the Strait is as important as the Suez and the Panama Canals. Since the latter half of the 20th century, Singapore has developed as a center of world trade, taking advantage of its ideal geographical location. Its national territory of only 716 km2 is similar to that of Tokyo. It is home to 5.5 million people, the same as Hyogo Prefecture. Whether it likes it or not, Singapore is constrained by the size of its land. In the coming years of the 21st century, Malaysia is set to become the second Singapore. Johor Bahru, which borders Singapore, is expected to play a particularly major role. Malaysia comprises 330,000 km2 and a population of 30 million. With its rich natural resources, Malaysia has developed significantly, and is closing in on the developed countries. This was my third visit to Johor Bahru. My first time there was for a water-related forum in November 2015. What strikes me every time I visit is the city’s richly green environment. In the future, Johor Bahru is sure to become the core of the world, not just of Asia. While looking out the landscape of Johor Bahru from the train window, I asked myself what I could do to contribute to further economic growth of the city while conserving its green environment. From August 28 to September 2, the World Water Week in Stockholm (SWWW) will be held under the theme “Water for Sustainable Growth”. The APWF, for which the JWF serves as secretariat will participate seminars on Eye on Asia Day during SWWW, and is planning to co-publish the 3rd edition of Asian Water Development Outlook with the Asian Development Bank, which measures water security in Asia and the Pacific countries in five dimensions. In addition, the JWF will hold a NoWNET members' meeting to have a discussion on the future activities of NoWNET, a network of country-level water partnerships among developed countries, and collect information about global trends in the water sector. The Asia-Pacific Water Forum (APWF), one of the supporting organizations for SIWW 2016, organized its 19th Governing Council Meeting in July 13 and the special event to celebrate the 20th anniversary of the World Water Council (WWC) and the 10th anniversary of the APWF in July 12. APWF also joined the ASEAN +3 Water Ministers Forum in July 11, co-hosted by the Ministry of the Environment and Water Resources and PUB Singapore, and the Global Water Partnership (GWP) PANASIA Workshop on Urban Water and Management (UWM) in Asia, held in July 14 and 15. Mission Uchimizu Headquarters, which the JWF serves as secretariat, held the Shintora Uchimizu Event 2016 in Tokyo on July 22, a day known as Taisho, considered being the hottest day on the lunar calendar. This marked the kick-off of this year’s Uchimizu Month. Shintora-dori is a symbolic street connecting the 2020 Tokyo Olympic/Paralympic main stadium and the athletes’ village. People from the neighborhood and the public and private sectors worked together for the success of the event, and all could feel the cooling effect of Uchimizu. We will promote Mission Uchimizu 2016 throughout Japan during Uchimizu Month (July 22-August 23) to ease the heat-island phenomenon, calling on people to sprinkle rainwater and used water on the ground around them. We hope this will facilitate a sound water cycle in cities and encourage exchanges between neighboring communities.